After stories of residents reclaiming streets in Indian cities like Gurgaon, Bangalore and New Delhi for walking and cycling, and even recreation, it is now the turn of a civic body to do the same by invoking policy. The corporation of Chennai (formerly Madras) has launched a Non-Motorised Transport (NMT) project to build world class facilities for walkers and cyclists on the city streets. The new NMT policy inked by the corporation guarantees as much as 60 per cent of its annual transport budget for creating infrastructure for pedestrians and cyclists, a first in the country. Notorious for its worst road safety record, the city has vowed to eliminate all pedestrian and cyclist road deaths by 2018. The new NMT policy aims to arrest the decline in cycling and walking, a familiar mode of transport across India, drastically fallen today compared to 10 years ago. “We are not doing anything new,” says B V Babu, who as Executive Engineer of Special Projects for Chennai Municipal Corporation, heads the NMT project. “The city corporation is supposed to provide footpaths, but the increasing number of cars and other vehicles meant that motor vehicles encroached on the space of pedestrians. We had wide footpaths in the ’70s,” he adds. Under the new project, the corporation will also build private motor vehicle-free zones, like a planned zone in the popular Thyagaraja Nagar, heritage walkways such as a new one in Mylapore, and green ways. “Chennai is going to get a metro and a mono rail is also in the pipeline. These public transport facilities will generate a lot of short distance pedestrian movement,” says Mr Babu. In the next six months, the corporation will also launch a cycle sharing system to address the first mile and last mile connectivity. With an initial strength of 3,000 cycles and 200 docks to pick and drop them, it will be the biggest in the country. 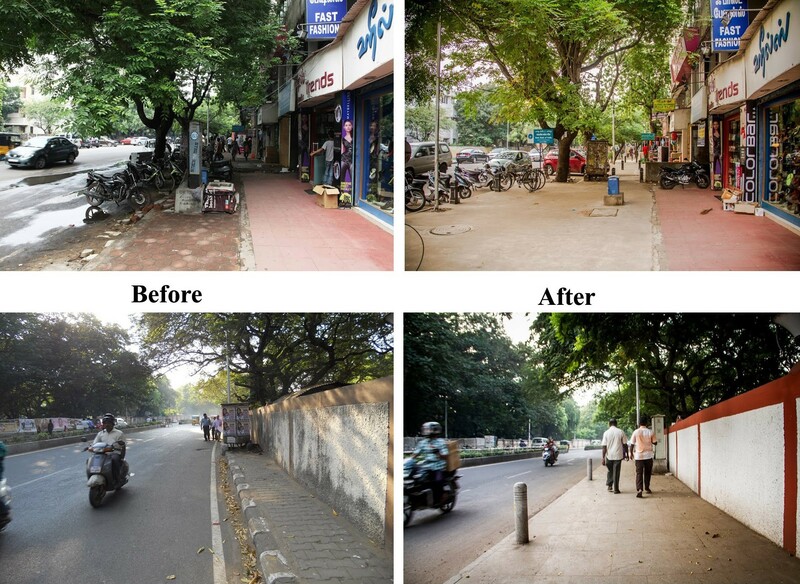 “In an age of vanishing footpaths and widening carriageways, the Corporation of Chennai has adopted a policy that has made pedestrians, cyclists and public transport users its priority, giving these social heroes their due,” says Shreya Gadepalli, Regional Director of Institute of Development Policy ( ITDP), which helped the civic body in scripting the policy. “The policy is not an empty rhetoric. It has set the right goals and backed it up with money—at least 60% of its transport budget,” adds Ms Gadepalli. According to ITDP spokesperson Aswathy Dilip, the new NMT policy of Chennai is a “complete U-turn” as it retains precious road space from chaotic traffic and unregulated parking and haphazardly placed utilities. “Prioritising people over cars is the important element. Mandating a minimum of 60 percent of city transport budget to construct NMT infrastructure is a clear demonstration of the corporation’s commitment to building safer streets,” explains Ms Dilip. The new policy has set the ambitious goal of safe and continuous footpath on 80 per cent of all streets besides an increase of cycling share by over 40 percent. However, the challenge will be the actual change on the street, cautions Ms Dilip. Since the introduction of the new NMT project early last year, the corporation has completed footpath construction in 26 streets under its first phase. A total of sixty streets will get new and wide footpaths in the current second phase of work.All arterial streets of the city will come under the NMT project. The corporation has proposed segregated cycle tracks, beginning with the Besant Nagar Second Avenue. A technical training and outreach programme for the corporation’s engineers has also begun with the help of ITDP and the city-based Anna University with its focus on the needs of NMT users along with design planning and implementation. Two batches of engineers have already passed out after four weeks of training. Surveys have also started to observe pedestrian and cycling use on roads. The project has also involved multiple stakeholders like public utility service agencies and traffic police. At the Urban Mobility India Conference organised by the federal Urban Development Ministry in New Delhi in November 2014, the Best NMT Project award was won by the Chennai Corporation. The project also won a special mention at the Volvo 2014 awards last year. But the biggest honour will come from the people of Chennai when the corporation succeeds in fulfilling their aspirations.